Why Should You Sealcoat? 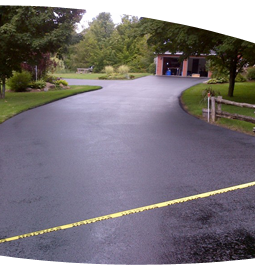 Professionally sealed asphalt is protected from oxidation, erosion, potholes, frost damage, and general disintegration. 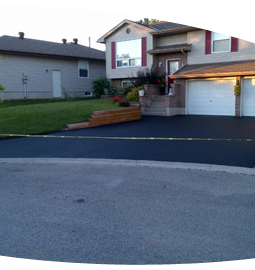 Well-sealed asphalt provides a black satin-like surface that enhances the beauty of your property and lawn giving you a neat and attractive appearance. It adds to the pride you have in your property and assures higher resale value. When it comes to beautifying your property and protecting it from deterioration, Sealcoating is one of the most important and economical means of asphalt maintenance. Sealcoating in conjunction with Crack Repair is guaranteed to significantly extend the life of your asphalt surface. Pave-Tech uses premium 100% undiluted oil-based Protective Sealant direct from the manufacturer. The Sealant is applied using a Commercial Sealant Unit which applies the sealant at 300 PSI ensuring a smooth and even coating over your asphalt surface. Automobile chemicals such as gas, oil, transmission fluid, and antifreeze accelerate the natural oxidation process. Water, which penetrates the pavement, stresses the asphalt and creates cracks damaging your surface and tarnishing its appearance. 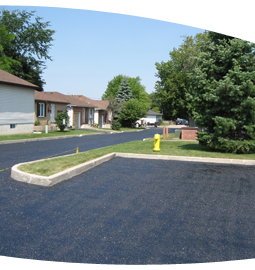 These two reasons alone warrant the small investment you will be making for your asphalt. With a Pave-Tech Asphalt Sealing Treatment, you can protect your investment from all of these destructive elements. The natural attributes of your pavement are sealed in, while the damaging factors are sealed out! We will gladly visit your home or business and provide you with a FREE professional analysis. We will let you know what needs to be done and how little the Pave-Tech Preventative Maintenance Program will cost�and most importantly, how much it can save you!